My vision for the direction of my research requires me to be able to rapidly prototype PCBs. 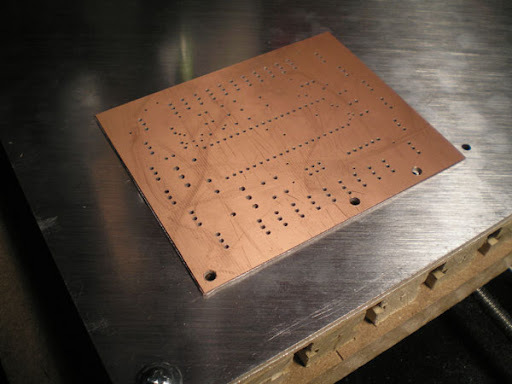 I started working towards this goal way back in March of 2009 when I attempted milling on a darwin. This is why I am building a mill. Through trial and error and a lot of reading I am realizing just how precise my manufacturing techniques need to be. I am also hitting a lot of obstacles. I found that bolting down the circuit board on my grooved bed causes the corners to be further from the milling head than the middle of the board by 0.1mm. It is absolutely essential that the board is perfectly flat. Otherwise the V shaped bit will mill away more than it should in the highest areas of the board, making the traces too thin. 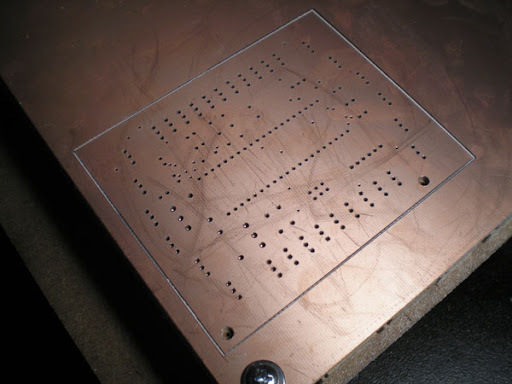 I stumbled upon http://millpcbs.com this week which promotes a very elegant solution to this problem. They suggest mounting an aluminum plate to a leveled bed and then gluing the copper board to the aluminum plate with super glue. I didn't have a piece of aluminum plate, but I did have some aluminum exit foil sheets from think tinker. First, I scored and drilled the board. Then I mounted the aluminum sheets and glued the board down. I used reference pins to make sure the alignment was correct. 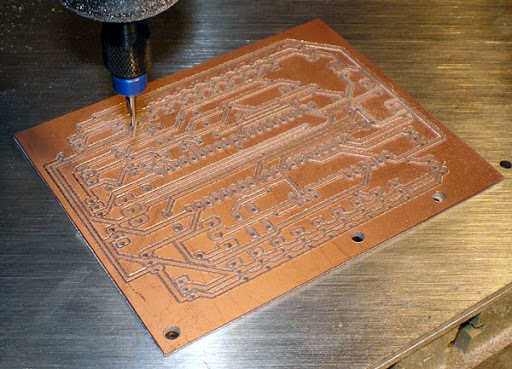 I then milled the traces using a 60 degree bit from think tinker and the pcbgcode extension of Eagle. I learned two things from this experiment. I learned that I should buy a precision 3mm bit because my reference holes were off by 0.5mm on one side. I also learned that I need an aluminum plate because two sheets of aluminum exit foil still bubbles up and gives an inconsistent bed. I will order it right away. I am also considering purchasing a 3Speed Spindle from http://www.cnconabudget.com/. If you pay close attention to the traces on the above image you will notice copper burrs caused by runout from my dremel. Using a more precise spindle should get rid of the burrs and allow for a higher resolution. I had a pretty good idea of how to build it but as things went together I saw some problems with the design and just did quick things to get it working.